Time to blast R.E.M. 's smash 1987 single, 'cause it's the end of the world as we know it. As San Diego Comic-Con-goers have been drooling over the Nightflyers trailer, widening their eyes at footage from Marvel's Iron Fist season 2, and getting 50 shades of fired up at the news of a Star Wars: The Clone Wars revival, FX made its own exciting announcement. Taking to both Twitter and Instagram, the network released two posters for American Horror Story season 8 that confirm its official subtitle: Apocalypse. This shuts down the popular rumor that the forthcoming season would be titled American Horror Story: Radioactive. 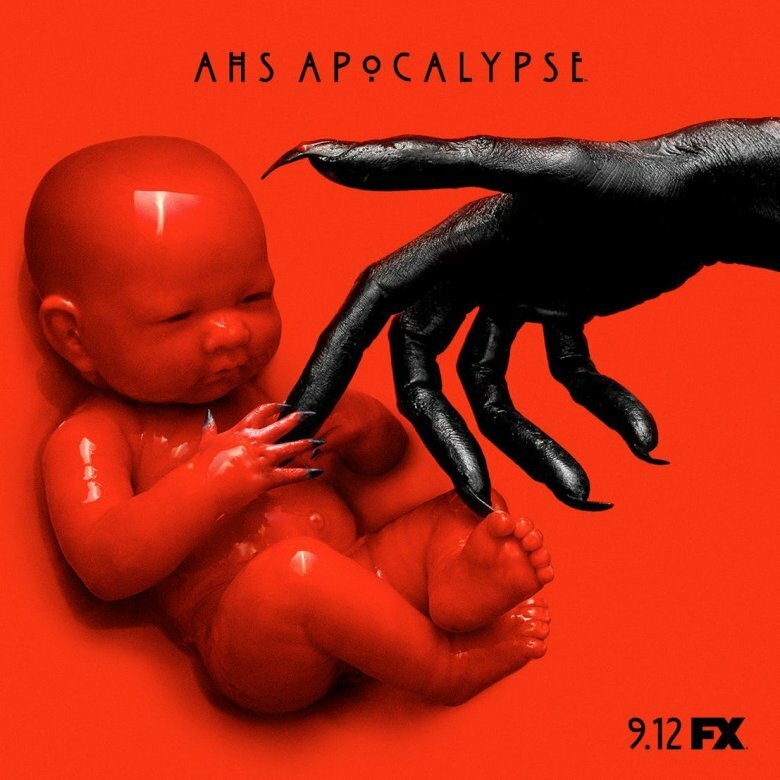 A crossover between American Horror Story season 1 (Murder House) and season 3 (Coven) that carries the tone of both installments, Apocalypse will take place 18 months in the future — exactly a year and a half from April 2018 if you want to get technical, since that's when series creator Ryan Murphy made the timeline announcement — and will feature a mid-season twist unlike anything viewers have ever seen before. AHS darlings Evan Peters, Sarah Paulson, and Kathy Bates are attached to lead the new season, with Taissa Farmiga and Emma Roberts returning to reprise their Coven roles as witches Zoe Benson and Madison Montgomery, respectively. Billie Lourd, Joan Collins, Adina Porter, Billy Eichner, Leslie Grossman, and Cheyenne Jackson also star, so there will be no shortage of spooky interconnecting stories and characters with hidden identities and ulterior motives in season 8. Looping back to the new posters, what exactly might they mean for the new season — one we know little about? It's hard to make any definitive statements, but it's evident that the upcoming episodes will likely deal with demons, Satanism, and creepy children based on these promo images. And speaking of kids, the hellish spawn seen in the season 8 posters may possibly represent Michael, the Antichrist and son of Vivien Harmon (Connie Britton) and Tate Langdon (Evan Peters) from Murder House who is meant to bring about — try not to get goosebumps here — the apocalypse. Dive back into the messed-up world of American Horror Story when Apocalypse returns to FX on September 12.